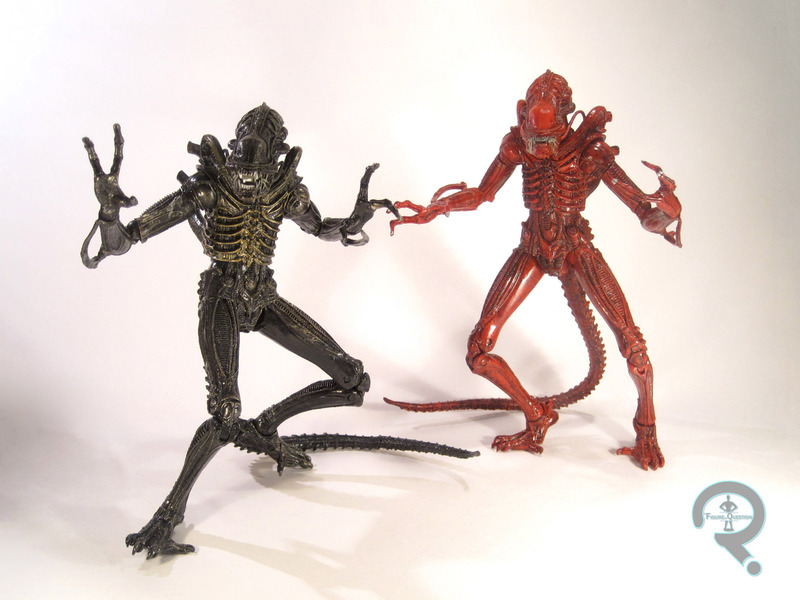 Today, I’ll be continuing my reviews of the most recent toyline to the greatest movie ever, NECA’s Aliens. In anticipation of the second series in the line, I’ll be reviewing the figures so far. With yesterday’s review of the basic Xenomorph Warrior, I wrapped up my reviews of the first series. Today, I’ll start looking at the two-packs, released to hold us over until the second wave hits. First up, it’s the “Genocide” two-pack, based not on the movie, but on one of the comics, wherein two different hives of Xenomorphs duke it out. These two figures were released as part of the first of three two packs released to bridge the gap between the first and second series. They each depict a warrior from one of the two hives. First up, the more unique of the two figures, the Red Xenomorph. Red here is meant to represent a Xeno from the second hive in the series. Red is very similar in styling to a red ant. Red is the exact same sculpt as the previous Xeno Warrior, so he stands about 8 inches tall and has 38 points of articulation. I won’t discuss the sculpt again, since it hasn’t changed. Unlike the previous Xenomorph, this one is molded in red with black accents. The paint work is well done, and the details in the sculpt are really made to pop. It’s cool to see this sculpt in a lighter color, because it means that you can really appreciate the work that went into it all the more. Like the previous Xeno, Red’s only real accessory is the removable back-fin-thing that allows you to put the head back a bit. Second, it’s a figure that looks a lot like the one we’ve seen before. And that’s because it practically is. Like the first Xeno, this one depicts the creature as it was seen in Aliens. The last figure attempted to go for the blown accenting present on the actual prop suits worn by the stunt actors in the film. This time around, NECA went for something more in line with how the creature in the first film is shown. The accenting here is done in silver and bronze. This could have turned out basdly, but it’s been done with the necessary subtlety to pull it off very well. The only difference between this figure and the series 1 version of the Xeno is the accent paint, but it’s the difference between a okay figure and an amazing one. I hadn’t planned on getting this set, preferring to just get the Xenos as they came along in the regular series. However, I was walking through my local Toys R Us, and there they sat. One lone set of them. So, I decided, what the heck and picked them up. I’m really glad I did. I know I didn’t have much to say in this review, having just looked at essentially the same figure yesterday. But these two were definitely worth the purchase. The Red Xeno is a lot of fun, and adds some nice diversity to the shelf, and the Black Xeno is a much needed improvement to the basic Xeno Warrior. If you’re just looking to get the basic Xeno, this set’s probably worth the plunge. Just, whatever you do, do no, I repeat, DO NOT try to read the comic book that this two pack was based on. You’ll never get that time back.